Wing Commander Frank Geoffrey Woolley, D.F.C., A.F.C., was born in Ilkeston, Derbyshire, 1922, the son of the then Flying Officer Frank Woolley. Upon the outbreak of the Second World War he wrote to his father, who by then was on Tedder’s staff out in Singapore, asking permission to join him by working his passage to the Far East. Arriving in Singapore in January 1940, he joined the Singapore Flying Club and his father took him for his initial training in an Avro Tutor- the name ‘W/Cdr: Woolley’ featuring prominently as 1st Pilot in the first few pages of his Flying Log Book. He was considered competent to solo after just 4 hours and 10 minutes of instruction.and having gained his ‘A’ Licence, he was posted to No. 4 Anti-Aircraft Co-operation Unit at Kallang in July 1940, and then joined No. 4 Service Flying Training School at Habbaniya, Iraq, in September. Commissioned Pilot Officer, Royal Air Force Volunteer Reserve, 29/3/1941, his first operational posting was to No. 244 Squadron (Vickers Vincents), at Shaibah, near Basra. He was in action soon after- the Axis powers had established a pro-German government in the country, and to counter this Britain sent a Brigade from India under the command of General Wavell. Arriving on the 18th April, the Iraqis responded by besieging the R.A.F. base at Habbaniya, but without any air support were forced to retreat. Wavell followed up by launching an assault on Baghdad, and on the 2nd May Woolley flew his first operational mission, as part of a two-plane sortie to bomb the railway line 60 miles south-west of Ur and gained the somewhat unusual distinction of winning an immediate DFC on hid first operational sortie. Piloting his Vincent, with Leading Aircraftman Howard as his observer, Woolley took off from Habbaniya, carrying four 250-lb bombs, and headed for the target around 100 miles from base. ‘As the Vincents sighted the railway, they noticed an armoured train loaded with troops on the line, and manoeuvred to release their bombs on this opportune target. As they pulled out of their runs with bombs gone, Woolley’s companion aircraft, another Vincent piloted by Flight Lieutenant G.B. Haywood, suddenly lurched away, damaged by the blasts of its own bombs. It staggered along, with its engine gradually dying, and smashed into the ground not far from the track that they had been attacking. Circling the wreckage, Woolley made the decision to land and try to rescue the injured crew of the downed warplane. The ground, sandy and rock-strewn, looked most unsuitable for the purpose but, helped by the robust and massive undercarriage, he managed to put down his Vincent near the broken remnants of the other machine. 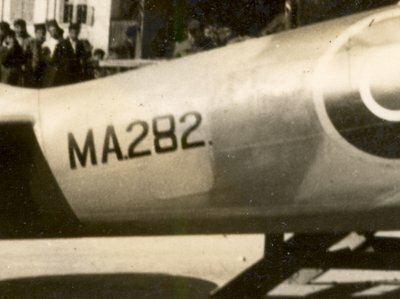 He and Howard hastily dragged the two aircrew out of their shattered cockpits, administered emergency first aid, and stowed them in the fuselage. Suddenly bullets began whistling around the Vincent as Iraqi soldiers appeared in the distance. To his dismay, Woolley found that his aircraft’s wheels were stuck in the soft sand. With the enemy only a few hundred yards away, he leapt into his cockpit and revved up the motor, as Howard deterred the advancing soldiery by bursts from his Lewis gun. 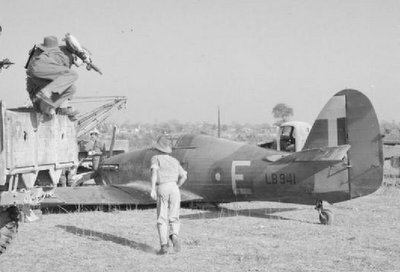 He taxied the ponderous aircraft out of the soft sand onto a stretch of firmer ground and then, the sluggish Vincent slowly came unstuck and climbed away to safety.’ Through his gallantry and presence of mind Woolley not only saved Haywood and his airman from falling into enemy hands, but by getting them back to base so they could receive urgent medical attention he undoubtedly saved their lives. For this he was awarded an Immediate D.F.C. ; the only comment he made in his Log Book on the matter was a pencilled-in ‘Shakey Do’. 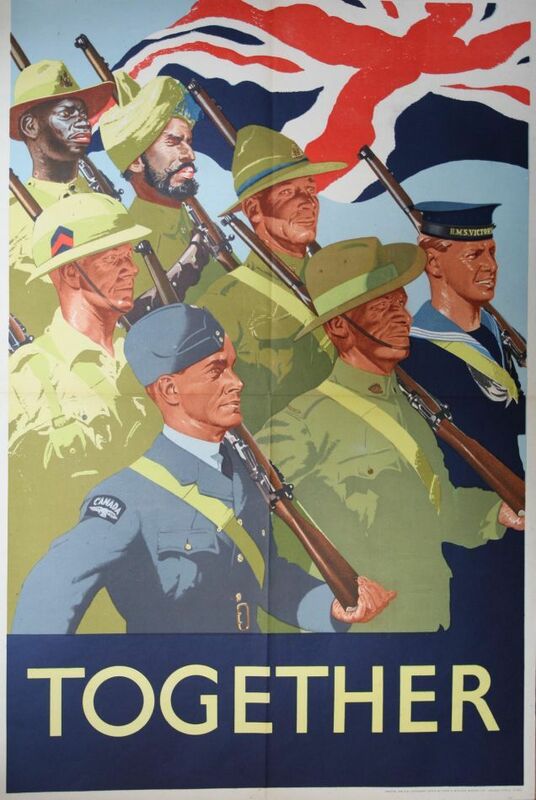 Baghdad fell to Wavell’s forces on the 30th May, but No. 244 Squadron continued to support the British Forces in the Middle East. On the 26th August he was shot down ten miles south of Ahwaz, Persia, before being rescued by the 17th Lancers. After a period recovering from wounds received in the crash, he rejoined No. 244 Squadron a month later, and was promoted Flying Officer, 29/3/1942. In the autumn of 1942 Woolley returned to England to train as a fighter pilot and was posted to No. 132 Squadron (Spitfires), Martlesham, January 1943, and promoted Flight Lieutenant, 29/3/1943, in August Woolley went on a Fighter Leaders’ course at the School of Tactics, Charmey Down, before being posted as a Flight Commander to No. 602 Squadron (Spitfires), Detling, November 1943. On the 2nd May 1944, he took part in with a force of 11 Spitfires from the Squadron in an attack on the great railway viaduct at Mirville, on the mainline between Paris and Le Havre, diving from 10,000 feet to release their bombs at 3,000 feet, scoring several direct hits, and taking out two of the 39 spans; a week later, on the 10th May, for the first time in eighteen months of combat flying, he opened fire on a German aircraft: ‘Attacked by 10 long nosed FW190’s. Had three squirts at one 190. Range too great. E/A could apparently outrun and outclimb us.’ (Log Book refers). On D-Day he flew over the bay of the Seine and Cherbourg Peninsula to provide cover to the American Forces landing on the beaches. On the 15th June the Squadron landed in France for the first time- the overnight stay was not appreciated: ‘Bombed and general bloody shambles all night. Airfield worse than Desert!’. On the 2nd March Woolley was rewarded with his first Command, and was posted to No. 350 (Belgian) Squadron (Spitfires), Eindhoven. he claimed up his first destroyed on the 13th March, ten miles north-east of Hamm, Log Book states ‘Bounced 20 FW190’s. Claim 1 FW190 Destroyed (Flamer)’ . On the 24th April he got another ‘flamer’, this time a ME108 south of Wismar at 3,000 feet, and the following day he destroyed a Siebel 204 during an armed recce over Pritzwalk. His fourth confirmed Destroyed came on the 30th April, during a patrol over the Lauenberg-Elbe bridgehead at 2,000 feet: ‘One FW190 Destroyed “Flamer”‘ (ibid). With three victories in 7 days he was closing in on ‘Ace’ status, but time was running out. He had a final run in with the Luffwaffe on the 2nd May, whilst patrolling Wittenber-Schwerin, and chased 8 FW190’s and 1 ME262, but unfortunately the ‘Bastards got away in cloud.’ (ibid). Five days later the War in Europe ended. With four confirmed Destroyed, one probable, and one damaged, Woolley and for his leadership of No. 350 Squadron, during which period they destroyed at least 38 enemy aircraft, he was awarded a Bar to his Distinguished Flying Cross. 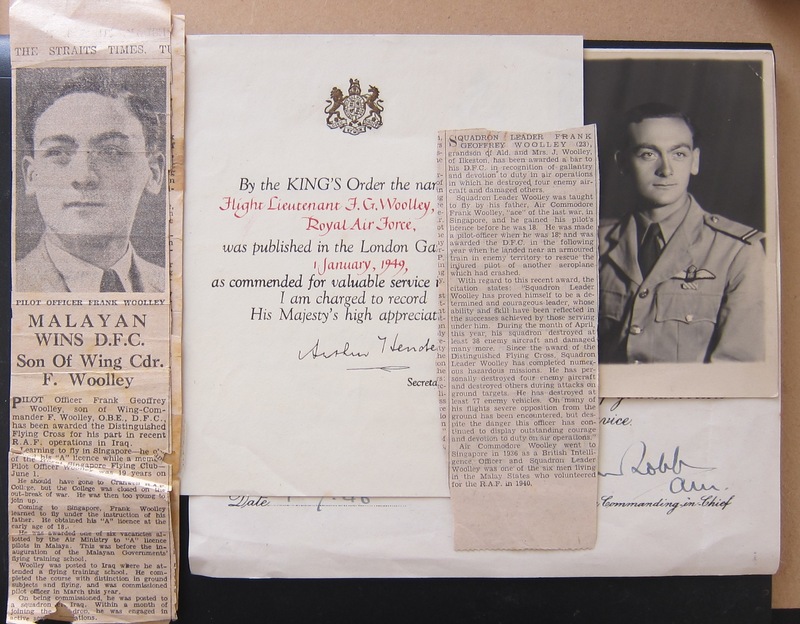 Awarded a King’s Commendation for Valuable Service in the Air in the New Year’s Honours, 1949, Woolley was promoted Squadron Leader, 1/7/1949, before moving to an Air Ministry posting in 1951. 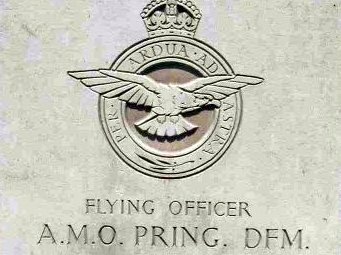 Promoted Wing Commander, 1/3/1954, and posted as Wing Commander (Flying) to 123 Wing, R.A.F. Wunsdorf, he was awarded the Air Force Cross in 1956 primarily as a result of his work with the Wing. There followed three years as an instructor at the R.A.F. Staff College before he went on a course to the R.A.F. Flying College at Manby, Lincolnshire. ‘At midday on the 28th November, 1959, a Canberra jet bomber took off from Manby for Malta, with Frank Woolley acting as navigator. The pilot climbed to 1,500 feet when he felt himself losing control of the aircraft and ordered the other two crew members to eject. Ejecting aircrew had to clear the aircraft at a safe height to survive the low-level bale-out and then operate their own parachutes. Breaking his arm as he left the doomed bomber, prevented him from using his arm to pull the ripcord. His body was found in a field, with the unopened parachute still strapped in place. An inquest judged that the severe injury to his arm was the cause of his untimely end, with the immediate trauma paralysing him for the critical period which meant the difference between life and death. His body was cremated and his ashes were brought back to Ilkeston. His medals and logbooks are currently for sale on British-Medals.co.uk . D.F.C. (GV1) reverse officially dated ‘1941’ and and reverse engraved ‘F.G. 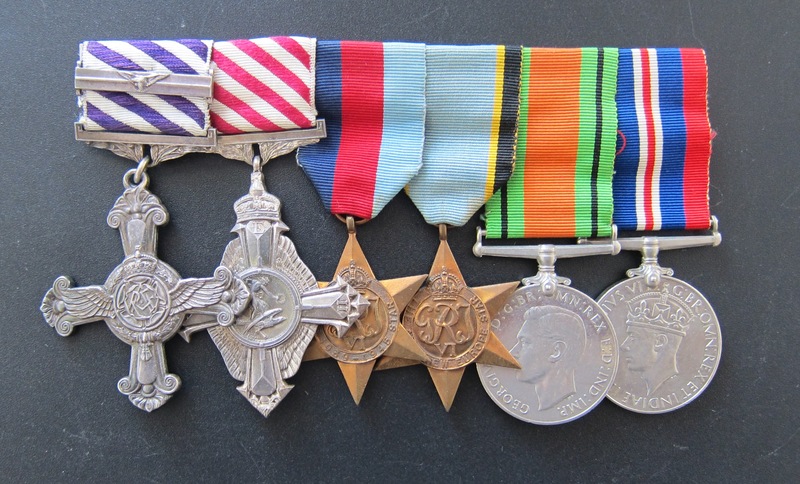 Woolley’, Second Award Bar, reverse officially dated ‘1945’ Air Force Cross, (E11R), reverse officially dated ‘1956’, 1939/1945 Star, Air Crew Europe Star, Defence Medal, War Medal. Named Buckingham Palace enclosure for the D.F.C. Pilot Officer Frank Geoffrey Woolley, Royal Air Force Volunteer Reserve, No. 244 Squadron. D.F.C. 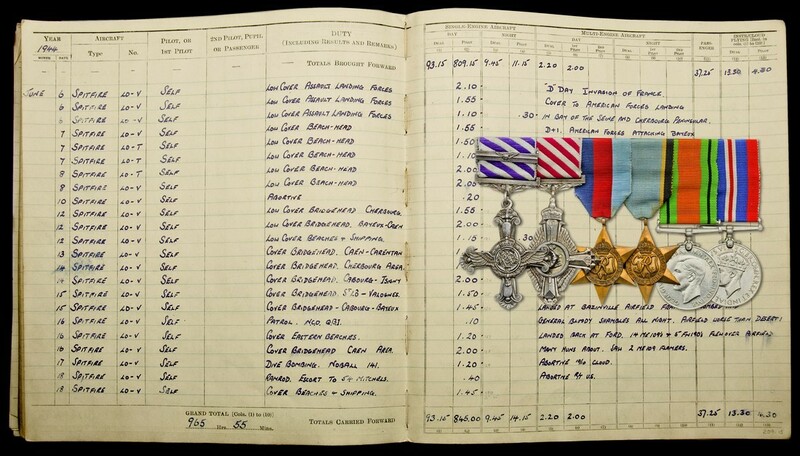 Second Award Bar London Gazette 24/7/1945 Squadron Leader Frank Geoffrey Woolley, D.F.C. R.A.F.V.R., 130 Sqn. A.F.C. London Gazette 31.5.1956 Wing Commander Frank Geoffrey Woolley, D.F.C. (105174), Royal Air Force. King’s Commendation for Valuable Service in the Air London Gazette 1/1/1949 Flight Lieutenant F.G. Woolley, D.F.C. (105174), R.A.F.